Here I will explain how to export data from gridview to excel in asp.net using c#, vb.net or bind data to gridview and export asp.net gridview data to excel in asp.net using c#, vb.net. In previous articles I explained export gridview data to csv file in asp.net, export gridview data to pdf file in asp.net, export webpage with images to pdf in asp.net, group columns in asp.net gridview header row and many articles relating gridview,asp.net, c#, vb.net. Now I will explain how to export data from gridview to excel in asp.net using c#, vb.net. <asp:Button ID="btnExport" runat="server" Text="Export to Excel"
If you observe above code I added one function that is VerifyRenderingInServerForm this function is used to avoid the error like “control must be placed in inside of form tag”. If we set VerifyRenderingInServerForm function then compiler will think that controls rendered before exporting and our functionality will work perfectly. this is very helpful assignment for database. This is very helpfull to me,, OK Thanks .. Thanks alot for providing very usefull articles. This code is working fine for my project, but If there is any value of gridview record in other language (arabic), then in excel file just it is showing some symbols..What to be done to get exactly ararbic values from grideview to excel file?? When Export an image from gridview to excel, In excel its shows the original image size.i want to fix the image height & width to 100px. Can you advise what I'm doing wrong??? Its Ok... the code works. this work but when attached this file to the mail and try to preview this then got an error for content error type..
How to set width for each column? How to generate the excel and save it in a folder in server? 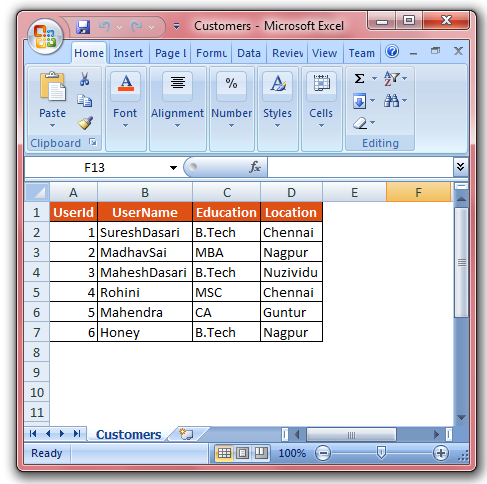 bt sir i want to set the excel cell property as text format how can i do this..??? I tried your code, it works but give me this error when try to open the Excel file, "the file you are trying to open is in a different format than specified by the file extension", can you please help? But when i delete it works fine but when i put AutoGenerateColumns="false" then will get an error "Object reference not set to an instance of an object." "RegisterForEventValidation can only be called during Render();"
How can i rename sheet and also add new Sheet? it shows HttpException near "GridView1.RenderControl(htw);" that Control 'GridView1' of type 'GridView' must be placed inside a form tag with runat=server. but i have placed inside a form tag with runat=server. what to do? How to create the VerifyRenderingInServerForm function. Please can you explain. 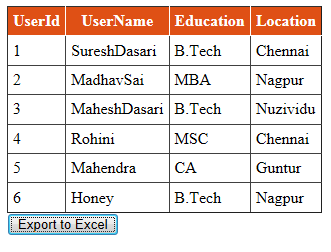 Hi, Suresh ,It helped me alot but the problem is after exporting to excel im getting links under excel header columns, please tell me how to avoid underlines / links. How to download multiple excel from multiple grid in a single button click.